The Costume Research Image Library has expanded with the addition of effigies from Sussex. A further 17 monuments in 15 churches are now available online after research into 50 Sussex churches. There are 36 new effigies (or groups of effigies) in civilian dress represented of which 24 are women and 12 men. The Tudor effigies database now offers 76 main images from Hampshire and Sussex. Decades which were previously unrepresented in the database such as 1541 to 1550 and 1591 to 1600 are now illustrated by eight and nine effigies respectively. The ten years from 1521 to 1530 have twice as many images as was the case in the pilot phase (up from four to eight) and there are seven effigies for 1551 to 1560, where previously there was only one. These additional effigies have expanded the eras through which features of dress may be studied by time tracking, comparing and contrasting the images. A more detailed report on the project is available. Further good news is that the Pasold Research Fund has agreed a small grant to cover expenses for another county to be investigated and added to the database. 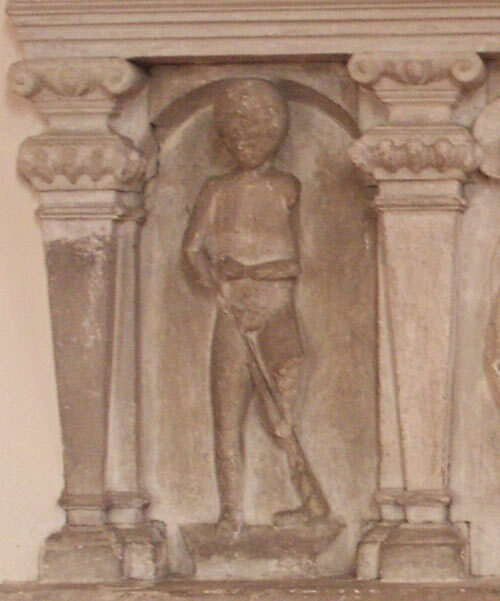 Work on Essex effigies is currently underway and will be published by the end of January 2008. A glossary of contemporary terms for garments is also being researched to facilitate accurate keyword descriptions of the effigies' dress in the future. Please let the project know how this database helps you as further funding depends on feedback (email jane@jmdandco.com). This is a pilot resource available free to anyone interested in the cut and construction of 16th century dress. You are welcome to browse the photographs, search the database for specific images using dates or keywords, and send feedback on the usefulness of what you have found with any improvements you would like to see. There is also an introduction to the Tudor effigies project available. This provides a detailed guide to the effigies as a research resource for 16th century dress and some information about effigies as memorials to the dead. Each effigy is represented in the database by a set of photographs: the monument on which the effigy appears, a main picture, a thumbnail and a series of details, such as headdresses, shoes and hemlines. The original version of the database contained images from churches in Hampshire (including the Isle of Wight). It was constructed over three months in late 2005 to test the feasibility of creating a national database of Tudor effigy images. It is estimated that Hampshire has 2.7 per cent of all the post-Reformation monuments in England (see: Llewellyn, 2000, Funeral monuments in post-Reformation England, 9). Not all of these monuments include representations of people. However, the Tudor effigies project aims to include examples from the entire 16th century (not just those of the post-Reformation era) and to cover all the "old" counties of England and Wales. The images available here probably represent one per cent of the available material for costume research. The project is funded by the Arts & Humanities Research Board via the Centre for Textile Conservation and Textile Studies, a partnership between Winchester School of Art, the Department of Environmental & Archaeological Sciences at the University of Bradford and the School of Art History and Archaeology and the Whitworth Art Gallery (University of Manchester). The database is researched and managed by Dr Jane Malcolm-Davies at the Textile Conservation Centre at Winchester School of Art, University of Southampton. If you would like to make contact, please send an email to jane@jmdandco.com.